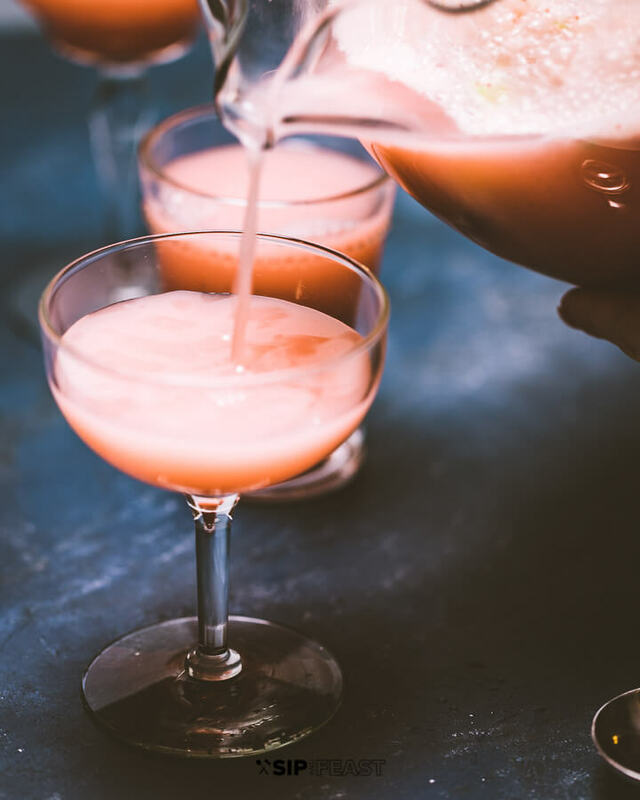 Sherbet Punch is a fantastic, crowd pleasing cocktail that is perfect for brunches, showers or any gathering. 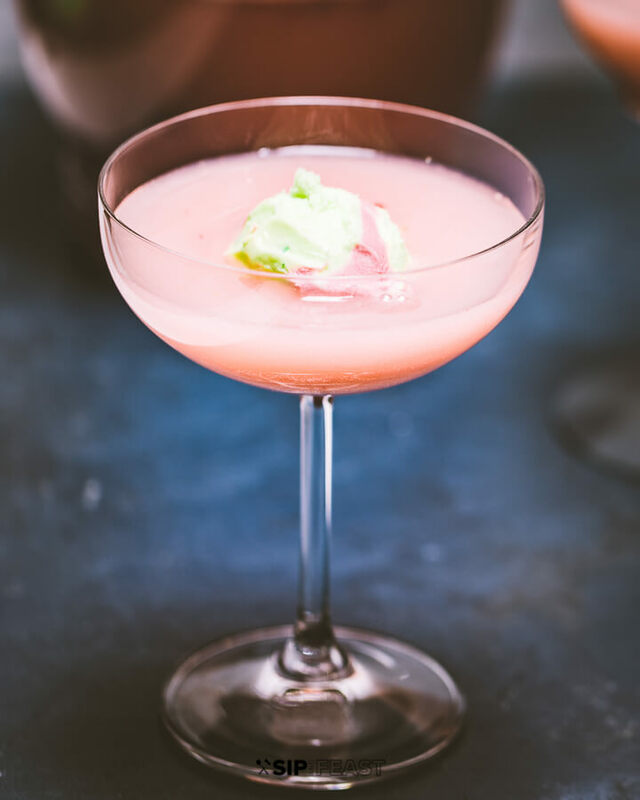 Easy to drink, it combines sparkling wine, vodka, frozen fruit, and as its name suggests, sherbet or sorbet. I have been enjoying sherbet punch, or as we pronounce it in Long Island (or mispronounce it), sherbert punch, for many years now. In the town where I grew up, there was a little Italian restaurant that my family members relied heavily upon as a gathering spot for many occasions – christenings, baby showers, bridal showers, engagement parties, etc. It was there I first tasted this cocktail. I had no idea what was in it, but I knew I liked it. They didn’t even call it Sherbet Punch, perhaps to not give away the “secret” ingredient. All I knew was that it drew a crowd and tasted so damn good. On one occasion, I arrived at the (insert christening/shower/party) event early and was fortunate to watch the owner of the restaurant prepare her renowned punch. In a large bowl she began adding scoops of rainbow sherbet. Fascinated, I leaned in and watched. She began emptying bottles of spumante and Sprite. Then, gave it a stir and that was it. It was that simple! So as we enter the season of multiple celebrations (communions, confirmations, graduations, showers, etc.) 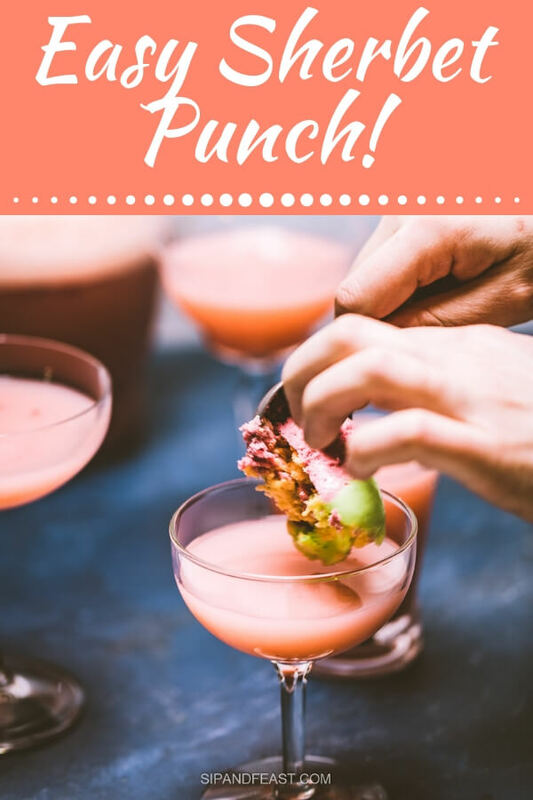 I thought this would be the perfect time to share this sherbet punch recipe with you! Orange Sherbet Punch Or Rainbow Sherbet Punch? 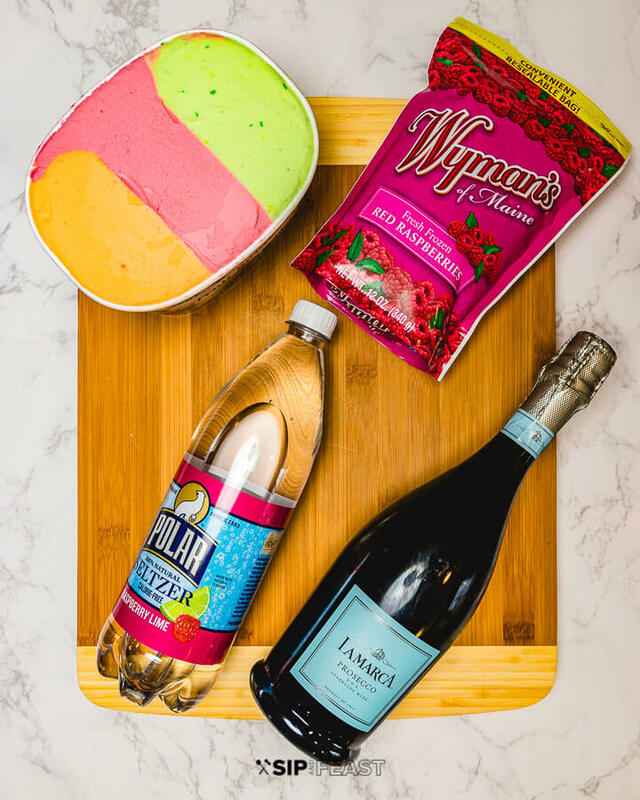 There are so many options with this particular drink, and really, using any type of sherbet, as long as it is to your liking, will yield fantastic results. How could it not? For our punch recipe, we used rainbow flavor, which is basically a combination of orange, lime and raspberry. This would be fine with plain orange sherbet as well. Likewise, you could easily use lemon sorbet in this recipe and I am sure it would be amazing. The point being, this is a hard one to screw up, so go with what you like, or what is available to you. I’d caution you against using ice cream though – this really does call for sherbet or sorbet. What To Serve With Sherbet Punch? Begin by gathering your ingredients. You’ll need some sparkling wine such as prosecco, spumante or champagne. Any of these will do. You’ll need sherbet or sorbet. Again, as stated above, rainbow sherbet punch or orange sherbet punch are both great. Use what you like! You’ll also need some type of seltzer, such as lemon, or raspberry-lime. You could also use Sprite. I also used vodka and frozen raspberries in this sherbet punch recipe, but those are optional. The tools we used for this recipe included a pitcher, but you could also use a punch bowl, measuring cup, and ice cream scooper, but any old spoon will do! We served our sherbet cocktail in whichever glasses we had available, which included several different coupe glasses, and juice glasses. This could be served in any vessel of your choosing. 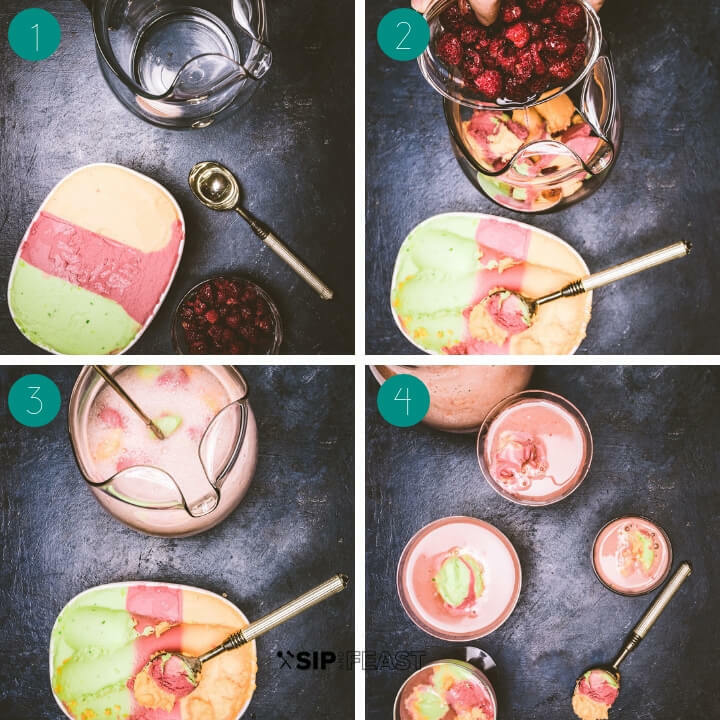 Begin by adding the sherbet to the pitcher or punch bowl, followed by the frozen raspberries. Then, add the vodka and the entire bottle of prosecco, or sparkling wine. Pour into glasses, and if desired, top each glass with an additional scoop of sherbet for good measure. Serve and watch your guests smile! This sherbet punch recipe is really simple and easy to pull together. I particularly enjoy it because anytime I taste orange or rainbow sherbet, it brings me back to my childhood. 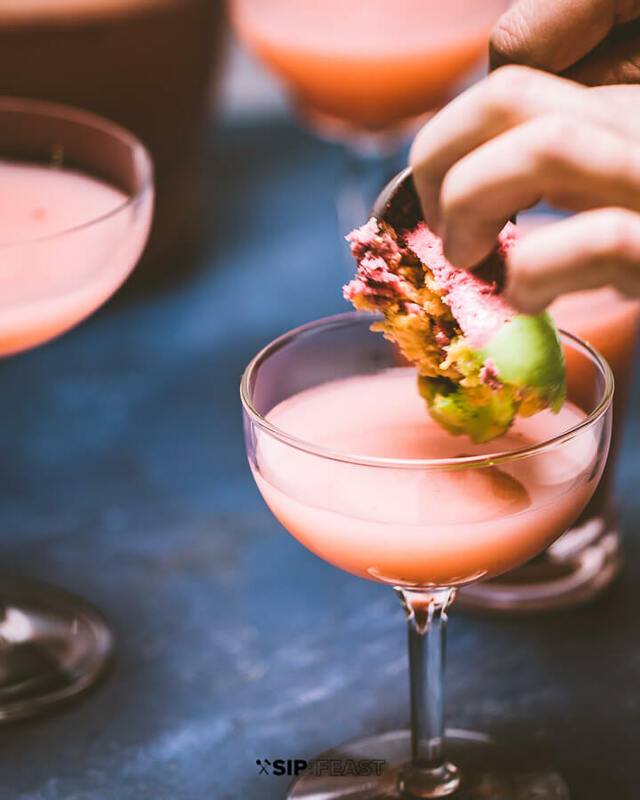 This drink is the perfect, whimsical combination of adult and childhood flavors, making it particularly awesome for bridal or baby showers! 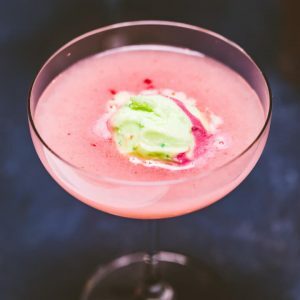 Looking For More Crowd-Pleasing Cocktails? 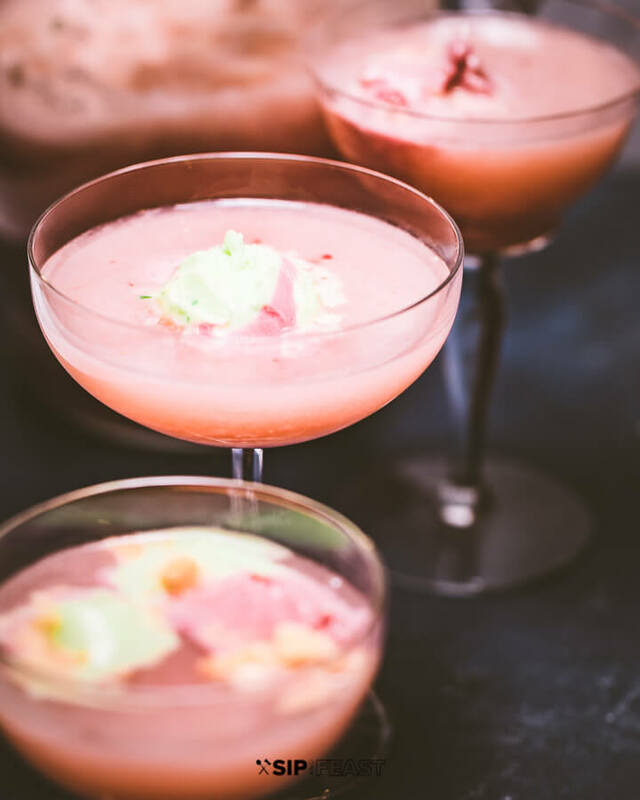 If you liked this sherbet punch recipe we would really appreciate it if you would share it on Instagram or Facebook using #sipandfeast. To a pitcher or punch bowl, add 4 scoops of sherbet. Add the sparkling wine and seltzer. Stir and serve, adding an extra small scoop of sherbet to each glass (optional). Feel free to enhance the flavor by using flavored vodka, such as orange or raspberry. You can use flavored seltzer, or Sprite. Any sparkling wine such as spumante, prosecco or champagne can be used. YUM! It’s like a dessert and cocktail in one. I love it. And it’s so pretty for spring and summer gatherings! Thanks! Yes it works great for all types of summer parties.